Sunday’s MLS Cup Final won’t feature any exotic formations. Bruce Arena and Dominic Kinnear aren’t exactly Marcelo Bielsa. But there should be enough differences between the two sides to lead to a tactically interesting final. The bigger market team possesses a much more intricate attack. In Arena’s 4-4-2, the movement of Landon Donovan and David Beckham has flummoxed many an MLS side. LA's 4-4-2 is a bit more fluid than Houston's, but the Dynamo possess enough defensive solidarity to trouble the Galaxy. Donovan often cuts inside while Beckham cheats toward the right wing. As could be seen in USA’s match with Slovenia, defenders are forced to make difficult decisions when midfielders shift from their assigned positions. Beckham’s movement is even more difficult to counter than Donovan’s, as he shifts right with the intention of swinging a cross to the left. Defenders on both flanks have to be aware of Becks’ positioning. Houston also uses crosses effectively in their 4-4-2, a strategy that was easily observed against the Union. Unfortunately, star outside midfielder Brad Davis won’t be available due to injury. And his absence won’t just be felt on the wing. Like Donovan, he sometimes ventures inside to help in the build-up. His likely replacement, Corey Ashe (with Jermaine Tyalor filling in for Ash at left back), is a more traditional winger. Forward Brian Ching’s hold-up play will become even more important without Davis, as will the between-the-channel runs of Ching’s fellow striker, Calen Carr. Defensively, the key to the match will be how effectively both teams press. Paradoxically, LA and Houston have each played (and won) playoff games where their defending led the charge and matches where they sat back and invited pressure. LA clearly made an effort to focus on defending up the pitch in their second leg, 2-1 victory over the Red Bulls. In the first leg, the end result, a Galaxy victory, was the same despite a much deeper line. 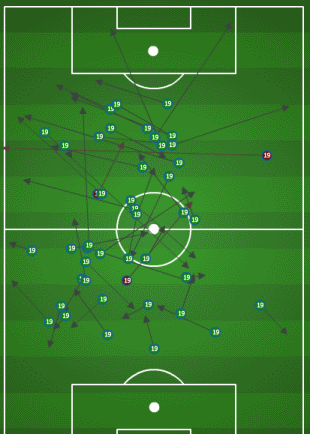 Houston pressed with slightly more intensity in the second leg of the semifinals than they had in the first, making 35% of their interceptions and tackles above the midfield line. In the 1-0 first leg victory, they only accrued 27% in the same area. Given how well both teams play on the counter, neither squad will constantly press, but the squad that presses most effectively will have a big leg up. - Robbie Keane needs to keep up his fine form after Ireland’s recent qualification for Euro 2012. Beckham’s crosses are a vital part of LA’s attack, but his service is meaningless unless someone gets on the receiving end. Keane is also no slouch with the ball at his feet. Juninho was almost perfect in the Conference Final. Pressing Juninho will be just as important as tightly marking LA's big names. -Another master-class performance from Juninho will go a long way to securing the cup. We’ve covered this before: Juninho’s vision is the key to Becks’ free-roaming role. - LA needs to man up when the ball heads into the box. Houston’s aerial ability will present a not unanticipated problem, as LA has shown less than stellar marking on set pieces. - Without Davis, the Dynamo need to command the wings. 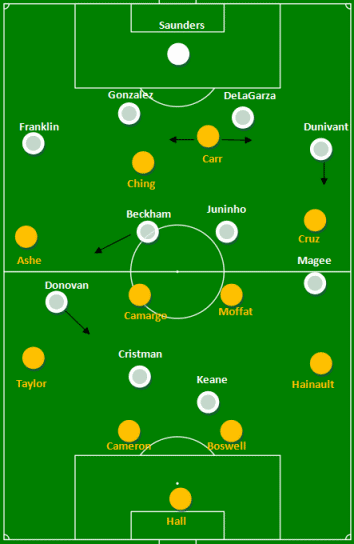 Control of the flanks would force Donovan to track back, prevent Beckham from unleashing his right foot, and pin back left midfielder Mike Magee, who likes to run onto Beckham’s crosses. - Kinnear must find the right moments to press. It’s impossible to maintain high pressing for a whole match; not even Barcelona can manage it. And if one player presses when another isn’t, LA is likely to counter with a vengeance. - Houston must also continue the great final third defending. It sounds a sophomoric suggestion but it has been a key facet of their recent success, particularly in the second leg of the Conference Semifinals. We feel LA’s shifting right flank, and the talented players performing that shift, give LA an edge. But the Dynamo will present a tough nut to crack, especially if they find the right moments to press. Gringos, how do you feel about this match? Will both teams press or will they look to play on the counter? Can Houston overcome the loss of Davis or will Becks+Donovan+Keane be too much to handle? It’s such an interesting set up between two teams pretty content to sit back and counter. Who will be the aggressor? You have to think LA will want to use its psychological edges (as home team and as favorite) to get that first goal and then tighten up and play on the counter.